A special edition paying tribute to those who braved the tortuous Mediterranean convoys, whose courage and devotion to duty saved Malta, and paved the way to victory. Spitfires of 126 and 185 Squadrons successfully fend off a last desperate attempt by enemy aircraft to sink the crippled American tanker Ohio, still some 80 miles short of the beleaguered island of Malta. Badly damaged and barely afloat the Ohio, assisted by Royal Navy destroyers Penn, (foreground), Bramham (lashed to Ohio’s port side) and Ledbury, limped into port to a tumultuous welcome, on August 15, 1942. Her vital cargo of fuel kept the island’s air defences alive, and ultimately made the island secure. 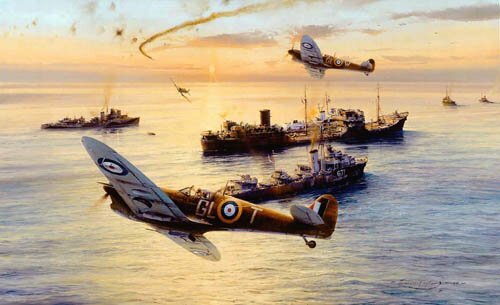 Joining artist Robert Taylor in signing each print in the edition FIVE distinguished signatures representing The Royal Navy, The Fleet Air Arm and The Royal Air Force, who fought for the defence of Malta and the Malta convoys.